TsukuBlog | Gangyu-Ji (願牛寺), said to be THE FIRST Temple SHINRAN Founded in The Kanto Area- just a 30 minute drive from Tsukuba University! In fact, because of the occassion of this special memorial day, this whole year has been turned into a celebration of Shinran of sorts- with a slew of new books, articles, and special magazine editions on the man and his teachings, Shinran related group tours, and a hugely popular exhibition on Shinran and Honen at the Tokyo National Museum in Ueno ( which ends tomorrow, Nov. 4th- it IS going to be CROWDED!). One distinctive feature of Shinran`s career is that he spent alot of time ( 20 years in fact, from 1214-1235), in the Kanto Area- much of it in what is now Ibaraki Prefecture (in which Tsukuba is located). You see, both Shinran and his teacher Honen had been sentenced to exile in 1207 for preaching their unorthodox ( and what were deemed to be dangerous) ideas. Honen was sent to the island of Shikoku, while Shinran was sent to Echigo ( what is now Niigata Prefecture on the Japan Sea side of Japan). Five years later both were pardoned. Unfortunately, Honen died in the same year. And Shinran, instead of returning to the capital ( as most would have done), chose to cross over to the Pacific Ocean side of Japan, into what is now called the Kanto Region. He would over the next 20 years preach his creed and found several important temples in the area, while others were established by his followers. There are now more than 20 temples in the Kanto Area which have important connections to Shinran ( and NUMEROUS more Jodo Shinshu temples which have sprung up over the years). These are often listed in the books and magazines which have recently come out on the man and his teachings. Much to my surprise ( and disappointment) most ( but not all) of these publications fail to mention THE FIRST TEMPLE which Shinran established after crossing over the mountains to Kanto- the GANGYU-JI TEMPLE (願牛寺)- which is located in Joso-City ( in what was formerly called Ishige Town)- a mere 30 minute drive from Tsukuba University ! The reason that I find this to be such a shame is that today`s Gangyu-Ji, though not impressive as a temple architecturally, is such a pleasant, peaceful spot- which seems miles away from modern Japan. And with the assistance of some old paintings ( which are reproduced on a signboard and a free leaflet available at the temple) one can conjure up in ones mind what the temple must have looked like in its glory years- with fine buildings, numerous curiosities, AND most interstingly- completely surrounded by water! 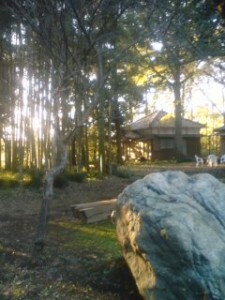 Seating atop the wooded hill on which the the temple stands ( though now it is a tiny structure with the priest only present on weekends) one can imagine Shinran trying to console the local villagers with the idea that they too ( and not only the priests undergoing austerities at the major state sponsored temples) could be saved. Three Edo Period hanging scrolls which make up a work called the Full-View of Gangyu-Ji and show what this temple USED TO look like- surrounded by water! Once a popular attraction for pilgrims and curiosity seekers (in the Edo Period) this site is often overlooked by contemporary writers because 1) it was built BEFORE Shinran`s wife joined him from Echigo and she does not mention it- and it is from her invaluable and numerous letters that most of the recent writings on Shinran are based, and 2) the present Main Hall is small, unimpressive, and the priest present only on weekends ( though it is still, as I have already said, an extremely atmospheric place). Let me tell you the story Gangyu-Ji according to the temple`s own records and also recount some of the local legends related to the temple which have survived to this day. Use the Period scroll paintings of the temple and its surroundings as a reference. As I have said already, this temple is said to have been the first established by Shinran after coming to Kanto, and though there were some points when there was no functioning temple on the site- there is still over 700 years of history associated with it. First have a look at the hanging scroll paintings. You see that the hill on which the temple buidings stood ( called O-Taka Yama) was surrounded by water, This was a pond ( or marsh) called Inuma (飯沼), which was itself surrounded by more marshes ( the Kinugawa River is 2 kilometers away). These areas were filled in during the Edo Period in major land reclamation project intended to control floods and create more rice land ( though flooding did in fact continue till the 20th century). It was this water which brought Shinran to this spot- because in medieval Japan ( and until the late 1th century in fact) water transport was the best way to get around. So that while today the site is located off the beaten path ( and is difficult to find) in the 13th century it was a hill touching the marshlands was a convenient location indeed. When Shinran was pardoned and had heard that his teacher Honen had died, he decided (as I have already said) to preach the faith in Amida to the people of Kanto ( called Bando back then). 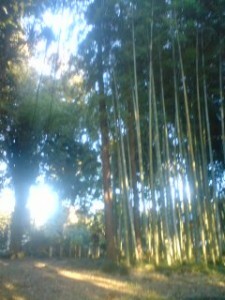 One of his followers from his place of exile had important relatives in what in now the area near Gangyuji- Lord Inaba. When Inaba met Shinran and heard his message he was deeply moved and invited him to stay in the area. Delighted at the chance ( since during his five year exile he had not built any buddhist related structures) he selected O-Taka Yama as a perfect spot. According to temple lore he stayed there for three years before going tp Inaba. The characters used to write the name of this temple mean FAVOR (願ーGAN)- COW (牛-GYU) and TEMPLE (寺-JI) and could be translated to read as the Temple of the Favor-Giving Cow ! A curious name for any Japanese ( or anyone familiar with the Japanese language) who sees them. There is an interesting legend explaining the origin of this name ( which I guess itself derives from a curiously shaped piece of wood which could be seen in the middle of the pond). According to the legend, when construction of the temple was about to begin, a cow suddenly appeared- out of nowhere- at the site. This cow helped tp carry all the heavy loads needed for the job- and when all the work was done- it just into the pond and diasappeared! Look at the hanging picture scrolls again. You can see in the central picture, portrayed in the middle of the pond, something large and black. This was called the USHI BOKU- the wooden cow- which probably the real source of the legend, was used to point out evidence that the story was true to gullible folk of past ages. The USHI-BOKU was mentioned in an illustrated guidebook of 1803, so it was probably still visible in the pond at that time. 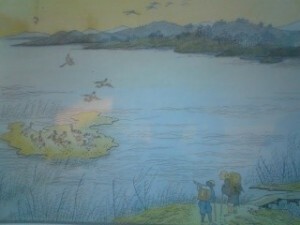 Looking at the left hand hanging scroll, you will see a rather large island portrayed standing in the pond. In past ages it must have been a convenient resting place for migrating water fowl. It was called GANJIMA ( Goose Island ) and is connected to a legend still told in the area. Among the local villagers whom Shinran came into contact with while he was at Gangyu-Ji was an old woman who had had five husbands- the last one a hunter- and lost them all. This woman was miserable in her belief that as a woman- and one married to a sinful hunter to boot- she would have no chance for salvation. Shinran eventually convinced her that belief in the Buddha Amida WOULD bring her to paradise. Filled with new found consolation and wanting to present the priest with something as a token of her thanks (but having nothing of value), she gave Shinran a pair of her late husband`s wooden decoy ducks. Shinran wrote the character 嶋ー islandー on these decoys and cast them off into the pond. He said- Let an island arise out of the pond where geese can rest there wings! He then released some birds- and behold ! An island small island emerged! He named it GANJIMA ( Goose Island). It is said that this island would disappear and reappear around the eqiuinox days each year. This was a sign for the local people of Shinran`s miraculous powers. 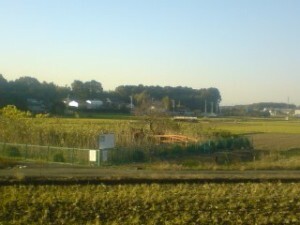 The Ganjima can still be seen today despite the fact that it is surrounded by rice fields! If you look at the right-hand hanging picture scroll you will see a boat. This was said to have been the watercraft used by Shinran to get around and must have been one of the sites to be seen at Gangyu-Ji through the Edo Period. In the year 1577 Gangyu-Ji was burned down (this was during the Period of Civil Wars- the Sengoku Jidai- in Japan) and the site stood temple-less for 150 years. The descendants of its priests became farmers, but still preserved the temple`s treasures and lived on the old temple hill. Then in 1891 misfortune struck again- this time in the form of lightning, and the temple was lost once more.At that time the USHI BOKU seems to have also somehow disappeared. Then during the Second World War ( as if adding insult to injury) the temple`s bell was melted down to make munitions. 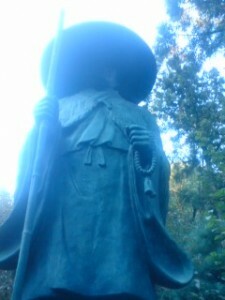 For several decades O-Taka Yama lay untended with the priests family having left the area. Happily, however, their descendants have come back and turned the hill into a beautifully serene spot which should help you conjure up the past. So in this, the 750th anniversary of Shinran`s passing, I can think of no better place for Tsukubans to go and contemplate his legacy than this nearby temple. Just drive west on the Hiratsuka Line past the Kinugawa River and the Toyoda Castle in Ishige until you see an Indian Curry Shop on you left. Turn left at the next light ( and then use the map which I provide a link to below. Thank you very much for introducing gwangyuji-temple in your blog.The other day,I heared from my wife that you visited our place. 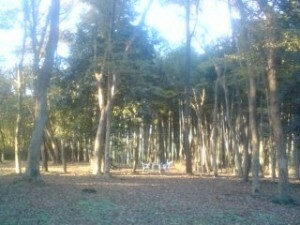 I was very pleased that you loved our temple and our forest,moreover Shinran-shounin. I was big surprised that you have known very well about Shinran-syounin. I want to meet you,if you agree our proposal. On25th this month,we have the celemony of New-bell re-built.From last year,we asked to many people for donation,and made new bell which was lost in World War2 as you knew. The celemony will start at 13:30 in our temple’s small holl. And moreover, the last day of this year named “oomisoka” ,we have the celemony of jyoya-no-kane. In the new year’s mid-night,you can ring bell. If you have time,please join us. :smile: Thank you Avi-san! You made an excellent article which introduce the Gangyu-ji, I think it was the first English article covering Gangyuji-Shinran-Honen-Inaba-clan. Well done. I also would like to play thta continuing effort of present Inaba-couple will be fruitful forever.